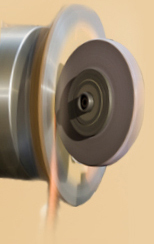 Our surface grinding capability emphasizes our long tradition of specialization in this area. We have assembled a collection of machines and operators who produce quality parts and are prepared to take on even your largest projects. Our 48” CNC creep-feed machine is state-of-the-art technology in surface grinding with its computer numerical-controlled creep-feed capability. Extremely high coolant flow allows stock removal rates up to .060 at 5” per minute with a 2” wide grinding wheel. Complex form of up to 5” wide also can be accommodated at a somewhat decreased stock removal rate. Our wide selection of surface grinders means shorter lead times. We offer eight reciprocating surface grinders to select from on both the day and the night shifts, permitting shorter lead times for even your largest parts. 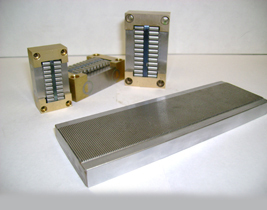 Our machinists have years of experience holding tight tolerances of flatness and parallelism.